PADS is a place where men, women, and children living in homelessness are provided overnight safe shelter and hot meals. Each PADS site is hosted by team of caring volunteers. Each guest will be greeted by a team of volunteers, who will register them on their first night and explain how the program operates. Guests will eat a hot, home-cooked meal and have opportunities to visit with the volunteers. Information about local social services will be provided to guests. During 2018-2019 the PADS services will be available from Sunday, October 21, 2018 through Friday, April 19, 2019. Shelter services are available each night from 7:00 p.m. to 7:00 a.m. Seven churches in Kendall County will serve as shelter sites, one for each night of the week. Review a list of these shelter sites here. Men, women, and children who need temporary overnight shelter and food may use Kendall County PADS. Children under the age of 18 must come with a parent or legal guardian (documentation of guardianship is required). The Kendall County PADS program does not allow guests at the shelter sites to use the alcohol or drugs. There is no restriction as to where the homeless person recently has been staying prior to coming to PADS . The program has a limit of 20 guests. The shelter program is looking for caring people who can be dedicated to serve as a volunteer just one time each month — 6 times over 6 months of the coldest time of the year. You may choose which night or which location works best for your situation. We will be pleased to welcome you as a volunteer and you will learn your role and responsibilities “on the job” under the guidance of an experienced site coordinator. So, please, SIGN UP today. We are still in need of 55 more volunteers: 8 for Shift I; 15 for shift 29 for Shift 3; 1 Laundry Driver, and 3 for our food crew. A total of 600 volunteers are needed for PADS to operate each night of the month. We invite adults from community organizations, schools, churches and businesses and interested citizens to serve as Volunteers. 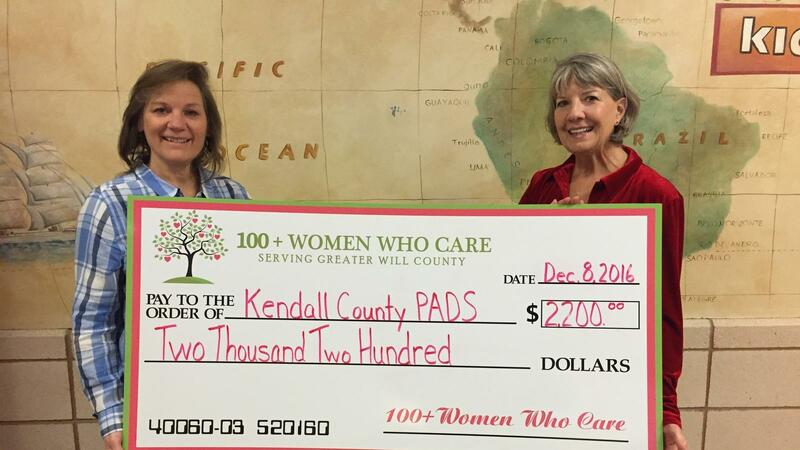 Donate:Kendall County PADS is a not-for-profit 501(c)3 organization funded by grants, gift, and private donations. The donations are used entirely for the operation of the shelter sites. The program is staffed 100% by volunteers – no paid positions. Checks can be made to: Kendall County PADS and sent to P.O. Box 1136, Yorkville, IL 60560. PADS gratefully accepts material donations, or you can make a donation thru PayPal. Volunteer: There are many ways to serve as a volunteer. Learn more about PADS volunteer opportunities. Pray: Whatever your faith tradition, please keep the Kendall County PADS effort in your thoughts. Pray for the guests who will be utilizing the PADS sites, for the volunteers who will be staffing the sites, and that the mission of PADS will be the forefront in all decisions. Be an advocate for PADS: Tell people what it is and how it works. Encourage people in your neighborhood, church, civic organization, place of employment, to get involved either as individuals or as a group. To receive more in-depth information for yourself, group, organization, or church, please contact the PADS Director. PADS is pleased to provide various printed materials or in-person presentations of any length for any audience. A brochure, the Volunteer Manual, and a PowerPoint presentation are available for you. These materials explain things in greater detail. For a copy of any of these tools, please contact PADS.